Postgraduate work visa rights - How are you affected? 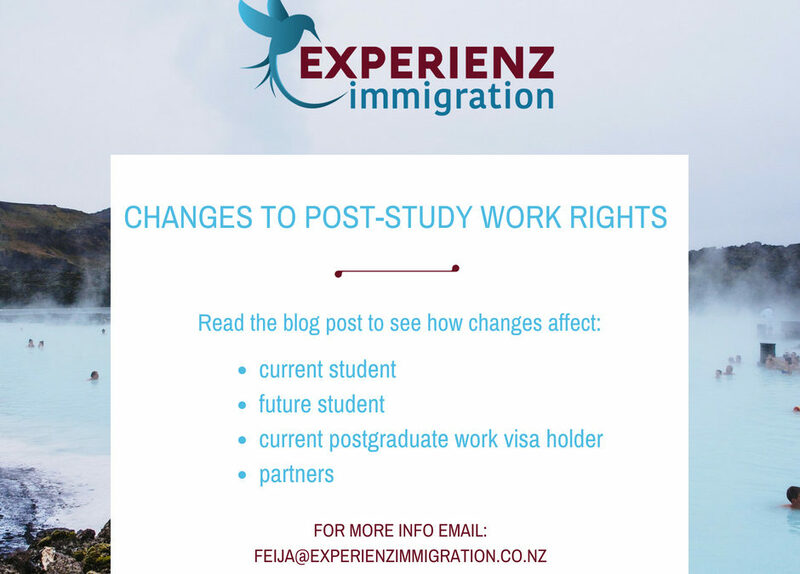 The new policy around Post-Study work rights affects international students who graduate in New Zealand after 26 November 2018. But it also has an impact on current students that have just graduated. Lastly, if also affects current holders of postgraduate work visas. An international student who graduates in New Zealand has the option to stay in New Zealand to gain work experience in the area they studied. Currently, there are two different visas available to graduates: a 12-month open work visa and a 24-month employer-assisted work visa. In the new policy only the open work visa exists. The duration of the open work visa is 1, 2 or 3 years. The length of the open work visa depends on the level of your course and where you have studied. To be eligible for a postgraduate work visa you must complete at least an NZQF level 4 qualification that was at least 30 weeks (one academic year) in length. You are an existing student visa holder if you held a student visa on 8 August 2018. You are also an existing student if Immigration accepted your student visa application for processing on or before 8 August 2018. An existing student that graduates after 26 November 2018 is eligible for a 3-year postgraduate open work visa. You get a postgraduate visa under the current policy if you graduate before 26 November and you receive a postgraduate work visa before this date as well. This means either a 1-year open work visa or a 2-year employer-assisted work visa. You can ask to have the employer and position removed from your Employer-Assisted visa after 26 November. You are only eligible for a post-study work visa if you studied at least a level 4 qualification with a duration of 1 academic year (30 weeks). If you currently hold a 1-year open work visa, you may apply for a further 2-year open work visa. Or, if your current open work visa expires before 26 November, you need to apply for a postgraduate Employer-Assisted visa. You may ask to get the position and employer removed from your visa after 26 November. a level 8 or higher qualification. Under the new policy, nothing changes for partners of Bachelor Degree students. However, for partners of students of level 8 and above courses things change. They can only apply for an open work visa if the qualification of their partner is on the Long Term Skills Shortage List. This aligns the policy with the policy for Bachelor Degrees. Consequently, fewer partners can apply for an open work visa while their partner is studying. An additional income during the period of study is very beneficial. Immigration New Zealand hopes that, as a result, more people will choose to study a subject that is on the Long Term Skill Shortage List. What happens if a worker becomes pregnant while on 2 year employer assisted work visa? The role is critical for the company so someone else will need to hired to do the job, in that case what happens to pregnant workers job/work visa? You are entitled to take paid parental leave (your employer has to apply for this to cover your wages) if you have worked for the employer for at least 6 months. They cannot refuse your request for parental leave but they may fill your position with someone on a fixed term contract or a contractor. Your work visa will remain valid during the period of leave because you are still in employment. Depending on the length of your work visa and how long you have been in New Zealand, you may or may not be eligible for publicly funded healthcare. Your area of study is included in the Long Term Skill Shortage List, so yes, your partner should be able to get a work visa. If your partner is eligible for a work visa then your children will be eligible for domestic tuition fees. Would existing postgraduate openwork visa holders need to pay additional fees for the additional 2 years open work visa post 26 November? please do advise. The exact policy details and procedures have not been announced yet, but as Immigration New Zealand hardly ever does anything for free, I suspect completing a form and paying a fee will be involved. I will more certain once Immigration releases the new policies and procedures. Hi ! I am planning to study cookery course( chef ) what type of visa will I be granted ? will I be eligible for open work visa ?? Can I take my spouse and children along with me ? Will my children be eligible for schooling in domestic rates ? If you wish to study in New Zealand you need to apply for a student visa. Depending on the length of the course you may be granted work rights. If you get work rights than you can work up to 20 hours per week as a student. Cookery qualifications usually are level 4 or 5. If they are only 6 months or a year, you will not qualify for an open work visa after you graduate. If the course is 2 years (or you complete 2 1-year courses) then you will be able to apply for a 1 or 2 year open work visa after graduating. Your partner is eligible for a visitor visa but your children would be considered international students. For them to be considered as domestic students, the level of your course must be much higher. You need to study a Bachelor Degree or a Post-graduate degree in an area on the Long Term Skills Shortage List. I am planning to take admission in level 8 post graduate in information Technology. Is it possible for my partner to get open work permit while I am doing level 8 and after completing level how long I get open work visa. A level 8 postgraduate diploma entitles you to a 3-year open work visa after you graduate. Your partner can apply for a work visa as your partner when you are studying a course in an area that is specified on the Long Term Skill Shortage List. Information Technology currently is specified on the LTSSL. I have been offered a place for post graduation diploma in information Technology in a university for march 2018 intake. Am I entitled to 3 years post work visa and is my husband as my dependent entitled to work visa as before? Your husband can apply for a work visa as your partner when you are studying a course in an area that is specified on the Long Term Skill Shortage List. Information Technology is currently specified on the LTSSL. By the way, I don’t think a visa application will be decided before your course starts in March if you have not applied already. Immigration has quite a backlog when it comes to student visa applications. Currently I’m studying Postgraduate diploma in Applied Informatics (level 8). My husband husband applied for spouse work visa and my daughter for dependent child visa on November 21st 2018.They didn’t get visa yet. Is my course applicable for the partners work visa? Yes, your partner should be eligible for a work visa as your partner. The new instructions came into effect on 26 November 2018. As your husband applied before that the previous instructions should be applied. I am planning to go for post graduation diploma in business – information system level 8 course in NZ. My partner is eligible for work visa or not. Currently I am in NZ . Your partner can apply for a work visa based on your relationship when you are studying a course in an area that is specified on the Long Term Skill Shortage List. Information Systems currently is specified on the LTSSL. Currently I am doing my PG Diploma in Logistics and Supply Chain Management, course finishes in July 2019. And my husband has an open work visa which expires along with me. When I apply for An open work visa after completion of my course, what will be the status of visa of my husband, is he eligible to get his visa renewed as per the new immigration rules? Your husband is eligible for an open work visa when you hold a postgraduate open work visa. Hi, I’m planning on studying post grad in business enterprise. Will my partner be eligible for work visa ? And post study work visa for both of us ? Unless your course is a level 9 Master or a PhD, your partner will not be eligible for a work visa as your partner if you study Business Enterprise. When you have graduated from your course and your course meets the postgraduate work visa requirements, you can apply for a postgraduate work visa and your husband should be eligible for a work visa as your partner. Hi. Im currently studying level 7 grad diploma in tourism management feb 2019 intake in rotorua.Will I be able to get my spouse open work visa like mine and my children as dependent after I finish studying? You can apply for a postgraduate work visa after you graduate. This will be valid for 2 years. Your wife and children can apply for dependent visa. I’m going to study for a Graduate Diploma (Level 7) in IT. I understand that you said it’s listed on LTSSL. However, if we look closely, the qualification listed is Bachelor Degree or higher, with a minimum of 360 credits. A Level 7 course is only 120 credits. So, does that mean a GradDip in IT is not on LTSSL? I haven’t said the qualification was listed on the LTSSL. I said that the area of Information Technology is on the LTSSL. The policy for a partner to be eligible for a work visa is: a person may apply for and be granted a multiple entry work visa if their partner holds a student visa to study for a level 7 or 8 qualification on the New Zealand Qualifications Framework (NZQF) in an area of absolute skill shortage as specified in the Long Term Skill Shortage List.